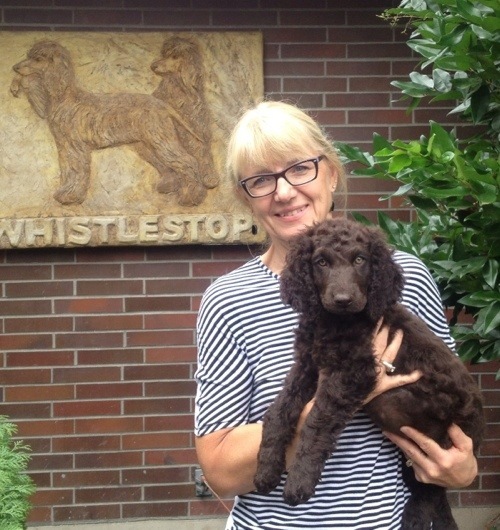 Today we had the great good fortune to visit with Linda and one of Tooey’s puppies, Finn, the former Mr Green (Tooey x JJ). Finn is a delightful dog, very friendly and affectionate. Although… not with Tooey so much. He kept just barking at her until finally she showed her teeth and snapped at the air next to his face. Maybe kinda sorta like a mom would do with an unruly puppy. Once that little bit of correction was in place, we were able to get a photo of Tooey and Finn together. And then, once Tooey was escorted to the car, we were able to get a shot of Finn himself. Just for comparison, here’s a photo Linda sent us just over 4 years ago, just after getting Finn home. Now, here are mother and son today. And here’s the boy himself, years later. I don’t think they look much alike, except for the widow’s peak at their foreheads, similarly shaped eyes, and their horizontal mutton chops (Tooey’s are currently clipped off). Their heads, coats, and body shape are quite different. Finally, we pulled ourselves away and drove home, us to be grateful to puppy people who invite us in for awhile, and Tooey to dream of birds. On April 6th, 2007, this little guy came to join us in Portland, Oregon. This look into the camera was an indicator of things to come. 8 years later, he still knows what to do when the camera comes out. I had been at work a few hours on Carlin’s 2nd day at home, and wanted to know how the puppy was doing. So I did what 21st century people do — I texted Russ. 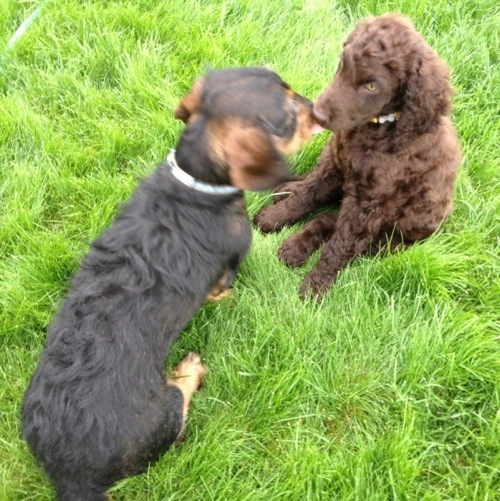 One of the very best pleasures of being a breeder is hearing back from your puppy people. And what makes it even better is when you see them giving the pup a full and happy life. 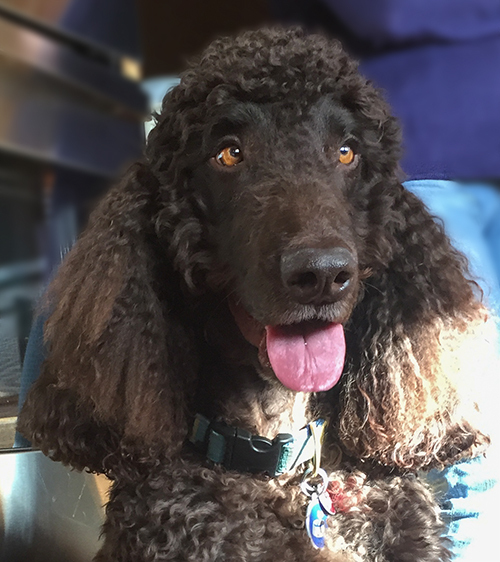 And even more wonderful is when that life includes doing what an Irish Water Spaniel was bred to do. So it wasn’t a complete surprise when Foley went out on his first hunting trip with Steve, and came home with birds for the table. Eventually we got to the club and to the field. We had the birds marked so we could learn Foley’s bird signs. He found the first bird, pointed it and flushed it. The bird was not hit hard and coasted a fair distance. We walked over with the dog. He found it and pounced on it. Not much of a retrieve was required since we were right there. I threw the bird back out for him and he delicately brought it back. He found the next bird but would not flush it — just circled around the bird — but he made it clear the bird was there. That bird was shot, and he went and got it and dropped it about 5 feet from me. He found the next bird but again would not go in close and point or flush the bird. [The bird flew.] Unfortunately, 8 shots later the bird was still flying, but Foley stayed on it. I was too busy laughing about the poor shooting and forgot the critical “No Bird! !” command. Foley followed the bird across the field. During his romp, he either found or just ran over another bird, and it too took off flying. He [Foley] came back quickly when called. The fifth bird was shot and coasted down. When we went over, Foley did not want to grab the bird as it ran away. Once it was dead, I tossed it and he retrieved it. The last bird was tough to find, but Foley kept at it and eventually started circling the area. I flushed it, and we shot the bird. Foley went straight out and brought it back perfectly. He appears to have a thing about grabbing a live bird and about feathers. He likes to grab the wings and will repeatedly drop the bird — sometimes but not all the time. He is either lazy or doesn’t like the texture. I did throw the birds back out and he would retrieve them fine. I am not sure about the pointing thing. My only idea is he likes to point, and I was pushing him to flush, and the birds scared him on the way out, or the first one pecked him. Who knows. I believe that he will become more aggressive on the birds with time and experience. There is definitely a lot of puppy still in him. He would hunt back and forth, then come back and say hi to all of us, run backwards, and zoom up and say hi, then back to hunting. Sometimes he would just walk the trail and not even get in the thick stuff. The field we hunted was thick with brush and tall grass. Tough hunting for a first time hunt and a young dog. Overall there were more problems on the trigger side of gun than with Foley. He needs experience and maturity. I think he did a great job for his first time out. I couldn’t be more thrilled to hear all this. And the pointing and retrieving stuff? 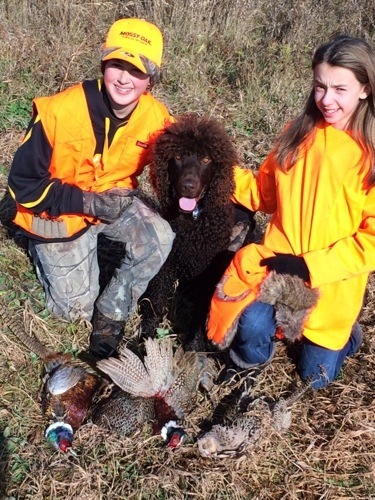 Cooper and Tooey both point upland birds, but with encouragement will flush the bird, and sometimes even trap it. For Foley, the retrieving will come with training, experience, and the love of doing what he knows in his bones he was bred to do. Chris came down to see the puppies, planning to take home a Faethe x Joey puppy. She has Joey’s brother, so a Joey puppy would make a nice symmetry. And while she liked the Joey puppy, she was just won over by Ms. Yellow, the last (but not least) Tooey x JJ puppy to go home. But the Joey family connection is still there, since Joey is Ms. Yellow’s grandsire (JJ’s sire). Fortunately, Chris is friends with the owner of another Tooey puppy, Pax (Mr. Red from Tooey’s first litter). So they will be able to share the joys and challenges of having an IWS from the same mom. And it looks like Chris’ house comes with ready-made company, a mini-wire Dachshund, Mike. They’ll be about the same size for only a little while, and then watch out! That makes three Tooey puppies in Canada — Pax from the Tooey x Cork litter, and Ivy (Ms Lavender) and Ms Yellow from the Tooey x JJ litter. With the Sorcha (the first Ms Yellow) in Australia, that makes Tooey a real international producer. Why didn’t I just get a rescue dog? There are so many dogs in rescues and shelters who need homes, I’m told. Why, I am asked, didn’t I get one of those instead of buying a purebred dog? Ask the same question to a car enthusiast: Why didn’t you just go down to your local used car dealership and get some car there? Why do you need a new car of a particular make and model? Or, how about asking a guitarist: Why did you have to buy that particular guitar? Couldn’t you have gotten a used guitar from Craigslist? To a woman who needs professional clothes for work: Why did you have to go out and buy new clothes? Can’t you go to Goodwill and get your clothes there? Of course these folks can get a used car, a Craigslist guitar, or Goodwill clothes. And sometimes, those are excellent choices for a lot of reasons: getting used things is “green”, it recycles good stuff to new uses, and it keeps stuff out of the landfills. But most of all, sometimes you can get well-made, workable, second-hand items that fill the need you have. And even though dogs are living beings and not inanimate objects like cars, guitars, and clothes, the principle is the same. I know because I’ve taken both paths. Before I got my purebred Irish Water Spaniels, I had a Malamute-mix and a German Shepherd-mix. Both I bought from backyard breeders. I didn’t know any better about why I shouldn’t do that. But now I do, and I won’t do it again. One of the dogs turned out to be a dearly loved, sweet companion, and the other turned out bad — really, frighteningly bad. It was all luck — we had no knowledge about the breeds, about the mixes, about the parents, how the mother was housed, fed, or cared for, about the environment the puppies had been initially raised in, about what they’d been fed or any training or socialization they might have been given (or not). And the people who bred them weren’t responsible breeders who cared about any of that or who could give us any ongoing information and support. We did a bit better with our third dog. She was a sweet Chow-multi-mix rescue from our local shelter. The shelter workers helped us pick her out, and she was a calm, placid companion for us for several years. But she also had some issues and problems, and we had no one who had known her from puppyhood to help us figure out what was going on. And since she was a mixed breed, we couldn’t really research what might be typical for her breed. Like the car enthusiast, guitarist, and professional, when it was time to get a new dog, we had specific requirements. We decided we wanted a water dog. A puppy who would grow up to be a size down from our previous dogs. A dog who would go for walks and hikes, and who would love the water and go with us on our boat. We wanted an active dog who would play and retrieve a ball, and one who wouldn’t shed as much as our previous dogs. We didn’t want a protection dog or a lay-about dog or an ordinary dog. Researching on the web, it quickly became apparent to me that there were three purebred breeds that would be right for us. At the same time, it became equally apparent that getting a mixed-breed would much less predictably get us what we wanted than getting a specific kind of purebred dog. And getting a dog that wasn’t right for us would be frustrating for us and sad for the dog. 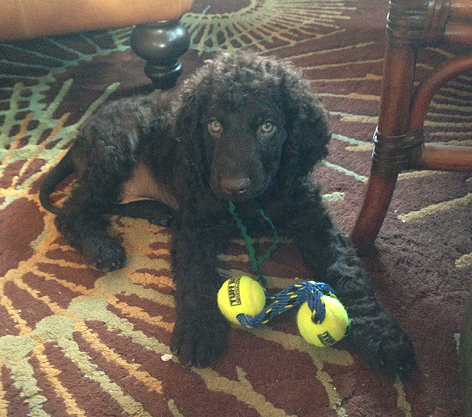 I’ve told the story of how we got Cooper throughout this blog, so I won’t go into that again. But I do think it’s important to stress how valuable and helpful it has been to stay in touch with the breeders of our Irish Water Spaniels. When the dogs have health or behavior puzzles, I have people to ask advice from, people who knew our dog from his first moments, who know our dogs’ parents, and can tell us how their parents, and grandparents, and great-grandparents behaved. 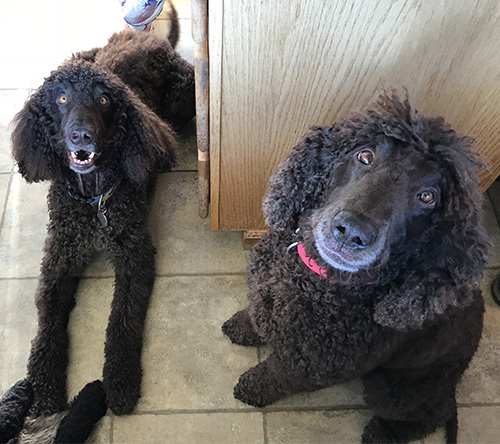 People who have such long experience with Irish Water Spaniels, that they can tell us what is typical and what isn’t, and what kinds of behaviors to expect. They can tell us what kinds of medications to avoid, what kinds of foods are best, and what health problems we might see. Staying in touch with our dogs’ breeders has expanded our social universe in ways we’d never had predicted. Plus we get to have the fun of sharing pictures and stories with people who actually want to hear about our dogs as many times as we want to share them. I had none of this with my three previous dogs, and I couldn’t have had, because none of those dogs were purebred dogs bred by responsible breeders. I have now co-bred two litters of Irish Water Spaniels. I hope I can serve these same functions for the people to whom I have entrusted my puppies, people who specifically chose purebred Irish Water Spaniels, plus my co-breeder and me and our puppies in particular, because the breed and the puppies meet their new people’s own specific requirements.